Look at the wonderful coats on them and even more, look at the hunting work they're doing!The other country working on hunting Barbets is Great Britain. Info coming up. While you're on Piotr's site look around at all of his Barbets...Well worth the detour! Even if they can just go "all out" for 5 minutes, they need to get rid of their energy! As long as they come back when you call them! No, this is not Caya, even though she looks like him a lot. Bloodline 2 of the Barbet de Camargue...Slightly different face, I said slight.Eyes are rounder which should give you an indication. 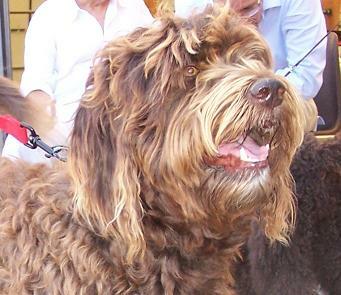 If you could touch the width of the head, it would be the same as the brown dogs below: wider. Slimmer dogs. Griffon origin ones have a wider chest. Look at how the feet are well set on the ground, nice and round. No ballerina poodle toes. What are ballerina toes? Have a look in Photos to help interpret the standard on the left, under Barbet Français. 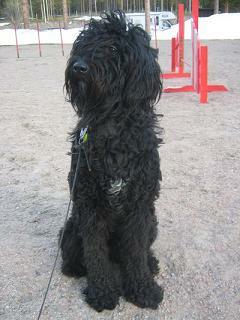 In the Barbet, there are many breeds.Just like any other breed. This should come as no surprise. What I have always done is try to make families as you know.There has to be a logic to me. I am happy to share the info with you. It helps all of us move forward.Those who choose to ignore it or attack, so be it. The Barbet which was also called Griffon for a long time has the origins it has.So do the Shepherd lines. What comes out is interesting to classify in a particular order. I'm doing nothing more than that.But, they have to be traced back to something...as far back as possible.This is done in all breeds.If some can't, that's their problem to justify their doings and objectibves and I can't speak for them, nor am I interested in doing it. The following dogs are obviously of the same origin and you can't whether you like it or not, deny the facts. Look at who the father is. Quite obviously, half of the litter will look like the father and half like the mother. Regardless of the pedigres being wrong, the dogs look-alike. They have the same origins. Let them be until they can come up with something more better than facts.Clubs too. And then you wonder why there aren't more breeders in France? What is the message clubs are giving people? People who try to breed properly are continually attacked with the main objective is to destroy them. What's the aim? Eh? Errrr... I'm not just talking about France..either. The club is one of the first to lament...and attack.Shouldn't they be the ones encouraging? Have I got this all wrong?